A hall bath used by all visitors was in need of a redesign. Since it was the only bathroom in the home to retain a tub for resale purposes, the homeowners were afraid they couldn’t achieve a “wow” factor. Dashing Design by Elizabeth Kavlock suggested several unexpected selections to make the space a showstopper while still maintaining functionality. A Kohler undermount tub was chosen and a tile flange was added on two sides while the other two sides were treated as tub decking with a seat and front ledge. A custom tub/shower guard is an unexpected touch in place of a shower curtain or slider. 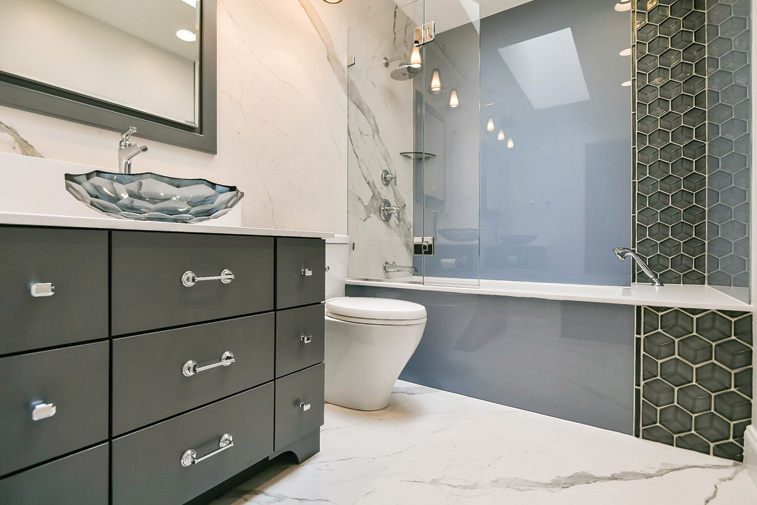 Custom back-painted glass gives a beautiful shine against the matte large format tile on the floor and the full bathroom-plumbing wall. Care was taken in the layout to ensure a great amount of veining for the eye to enjoy and also in matching the veining up to conceal seams. The Oceanside hex tile inspired the hex tile on the Kohler vanity bowl. The custom-painted vanity cabinet features all drawers. The designer added a mirror frame around the Kohler medicine cabinet to increase the impression of the recessed cabinet. Three Tech pendant lights on a wire were chosen instead of a vanity light. Chrome fixtures were chosen to accent the reflective qualities of some of the other bathroom elements. This bathroom is simply done, but the tile up the wall makes the tub area interesting. The veiling on the marble is beautiful and the application is very clever. Overall, this bathroom is simple and tasteful.